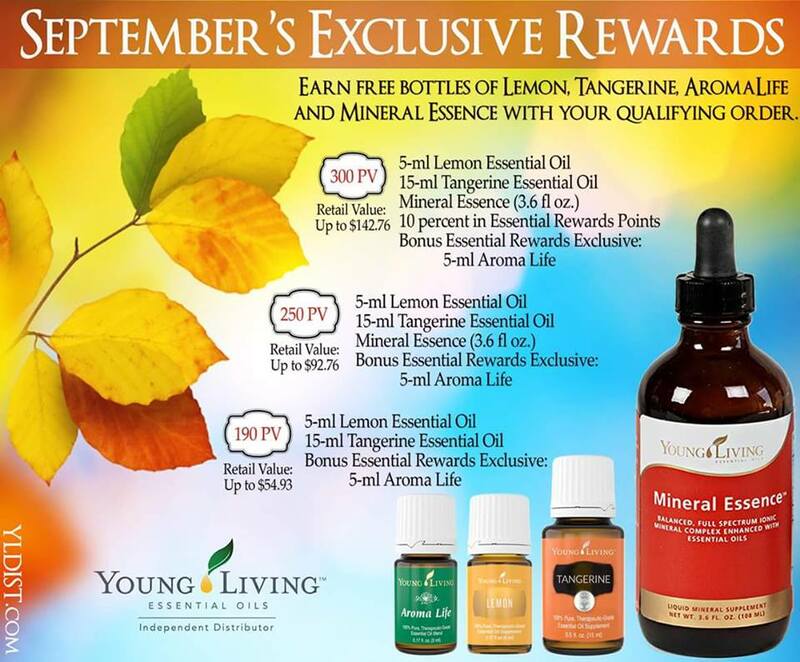 Southern Scentsabilities: Welcome the Fall Season with Young Living's September Promo! Welcome the Fall Season with Young Living's September Promo! Every month Young Living offers a great promotional to all members! 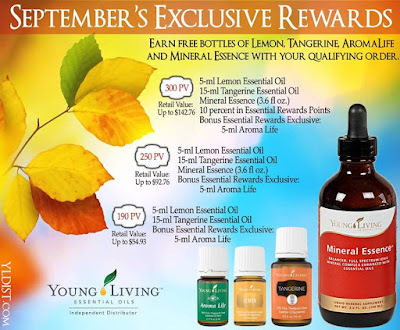 During the month of September you could get Lemon, Tangerine, and Aroma Life Essential Oil Blend as well as Mineral Essence with your Essential Rewards order! Lemon Essential Oil contains the naturally occurring constituent limonene. If you aren't familiar with this constituent and how it supports health and wellness, do a little research! Consult your reference guide or research online to learn more about this powerful health promoting constituent. We love to add Lemon Essential Oil to our morning smoothies, or I like to add a drop to my Ningxia Red or even into my homemade vinaigrette to pour over salads or fresh veggies. Tangerine Essential Oil has very similar properties as lemon, and we add this to our smoothies as well. I've also found that it to be a great substitute in my Peppermint Patty recipe. Mineral Essence™ is a balanced, full-spectrum ionic mineral complex enhanced with essential oils. I've been using this for over a year now and while it does have a unique taste, I find adding it to equal parts Ningxia Red and Pomegranate juice to be tasty. Aroma Life™ is a Young Living blend that combines the harmonizing effects of ylang ylang with known powerhouses cypress, helichrysum, and marjoram. Ylang Ylang essential oil is one of my favorites, which may be why Aroma Life has become one of my favorite blends to keep on hand. I love to apply it to my wrists, over my heart and even diffuse it to create a calming environment. Definitely check out Young Living's website for more details on these wonderful products! Purchasing products through the Essential Rewards Program will allow you to get all the bonuses available, although there are still great freebies for regular purchases. Let me know if you get these fabulous goodies and what you think about them!